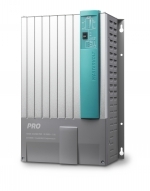 Mastervolt Combis integrate a powerful battery charger, a quiet and efficient inverter and a versatile switching system in one robust, lightweight and compact device. This multi-faceted product offers a carefree power supply for recreational and professional use. Possible applications vary from launches to 16-metre yachts, from campers to demo trucks, from holiday homes to remote businesses, and from backup systems to a grid connected system with energy storage. Each Mass Combi, Mass Combi Ultra and Mass Combi Pro can be used as an automatic stand-alone device for a non-stop power supply or as part of a larger power system. The MasterBus platform brings advanced system functions within reach and allows users to monitor a complete power system from a single display. The intelligent ‘one cable’ system minimises cable connections and saves valuable weight and space. After connecting, you can automate and adapt your system to your personal demands. If you require more power than the grid or generator can provide, the Mass Combi series will make up the shortfall by inverting from the battery. The Combi also ensures that the battery is recharged once the peak demand has passed. The integrated design of three devices into one, lightweight body and robust mounting clamps give considerable savings in (labour) time and costs. The built-in battery charger uses Mastervolt’s proven 3-step+ charging technology to allow the optimal charging of all battery types, including our advanced Lithium Ion models. The battery charger supplies a maximum charge current, even with a higher charge voltage, and speeds up the complete recharging of your batteries. Which Mastervolt Combi suits you? a 3-phase power supply. 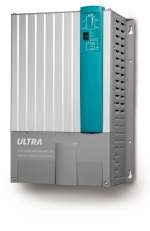 Five different Mass Combi Ultra and Pro models are available for systems ranging from 3,000 watt to 40 kW. Designed for professional use. This version has all the Mass Combi Ultra features but without solar input and secondary charger. The Pro provides the optimal balance of strength, versatility and cost. It is the perfect solution for professional applications. 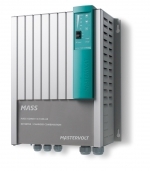 Mastervolt offers four Mass Combi models ranging from 1600 to 2600 watt. The Mass Combi is recognised as the best product in the market and has proven its reliability many times. It offers the best of both worlds: an advanced battery charger and a quiet inverter combined in one compact device.